Our Rebuilt Dodge D3500 Rear Axle Assembly is turn key ready to install axle. Our D3500 rear ends are hand built in our shop. Each axle starts out as a bare housing. We will verify it is straight on a lathe then begin the assembly process. We use Dodge OEM gears to ensure durability and longevity. The bearings and seals are Timken type, the best money can buy. After the center is built, we will install axles, hubs, and rotors. Each axle is then filled with fluid, painted and will be ready to go. No additional parts are needed for installation. 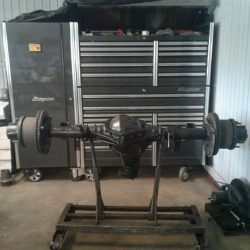 The Rebuilt Ford F-350 Super Duty Rear Axle Assembly is sold complete hub to hub. Each F-350 rear axle has been assembled from a bare housing to make sure each component is inspected during the assembly process. The gear sets are OEM. The bearings and seals are made by Timken. They are know as the best in the business. We inspect and clean each housing before assembly is started making sure you are getting the best possible product we can build. Every F-350 rear axle assembly includes rotors, hubs and axle shafts. It is filled with fluid and painted. This will be a turn key axle ready to install. All work done on your axle is performed at our shop. 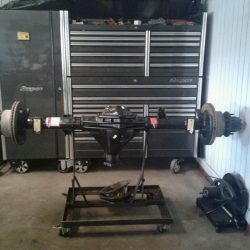 Our Rebuilt Chevy Silverado 3500 Rear Axle Assembly is a complete axle ready to install. Each Silverado 1-ton axle is stripped to a bare housing, put on a lathe to make sure it is straight, then cleaned. During assembly we only use OEM gear sets, never aftermarket gears. The bearings and seals are manufactured by Timken which are the best in the business. 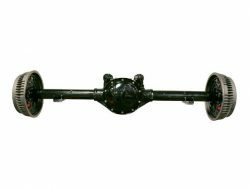 Each Chevy Silverado 3500 axle includes axles, hubs and rotors. Once completed, they are filled with fluid and painted. All axle work is done on site. No assembly is required once you receive our axle, it is ready for installation.